Today I’m going to wrap up the details on our recent trip to Grand Cayman. As you’ll see, we shifted into cruise control and simply relaxed our last couple of days. I was wakened at 6 am today by the house alarm next door going off. It sounded for 10 minutes or so and then quit. It went off a time or two throughout the day as well but it appeared that nothing bad was happening over there. I went back to sleep and got up at 8:30 am. We watched some TV then went for our longest beach walk yet — we left at 11 am and got back at 1 pm. It was so pleasant just to do this — walking in that environment was very peaceful and beautiful. We ate lunch and played some cards, then watched the day’s NFL playoff games, sat and chatted, and had pizza for dinner. We finished the day by playing more cards (FYI, Uno was our game), watching Shark Tank (one of our favorites), and heading to bed. How our beach looked today (a bit overcast out). Today we were up at 8 am, ate breakfast, and out the door by 10 am. 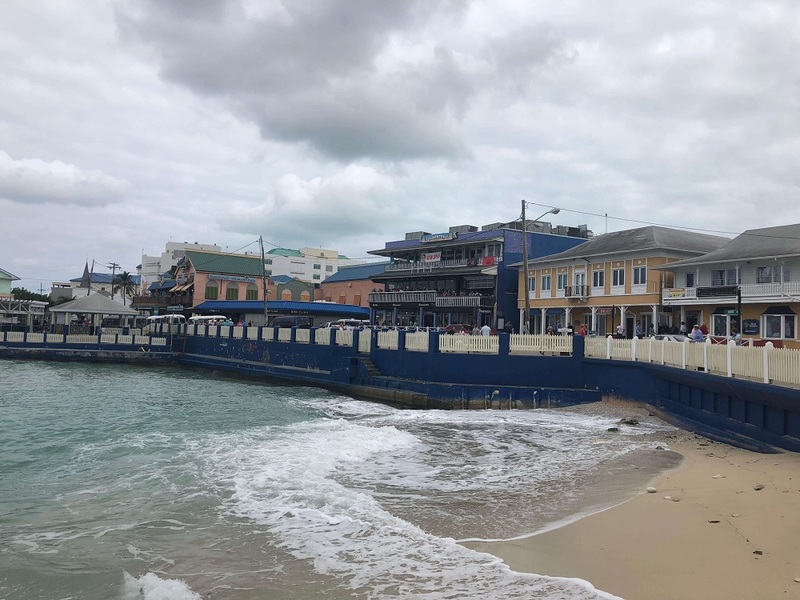 It was a bit overcast — a perfect day for a trip to George Town. We walked about a block to the main road, hailed a bus, and piled in. Ten minutes later we were downtown. Wikipedia says the population of George Town is 28,836, but that must count about 20,000 tourists. Ha! The town didn’t seem that big to us. And the crowds were not bad either. There were no ships in today so it was relatively mild. I’m sure Tuesdays through Thursdays would be packed as that’s when the most cruise ships come in. The town had the normal shops that you see in every other Caribbean city (t-shirts, jewelry, restaurants, etc.) We did a good deal of shopping, buying several t-shirts among our group. Downtown George Town shops and restaurants. Downtown George Town (closer view). My mom and dad broke off from us soon after we arrived as they had been downtown. They wanted to see the rest of the island so they took a set of busses all around the East End and back (they didn’t get back home until 3:30 pm). The four members of my family did some shopping. My wife grabbed an ice cream cone, then we got back on a bus to home. BTW, you’re not supposed to eat food on the busses but if you ask the drivers, they will usually let you. The “central station” (more like a parking lot) for busses in downtown George Town. We were home by 1 pm, ate lunch, and hit the beach. The wind had kicked up and so had the waves (it was funny to see the fish pulled back and forth in the currents). We only stayed out for 45 minutes or so. 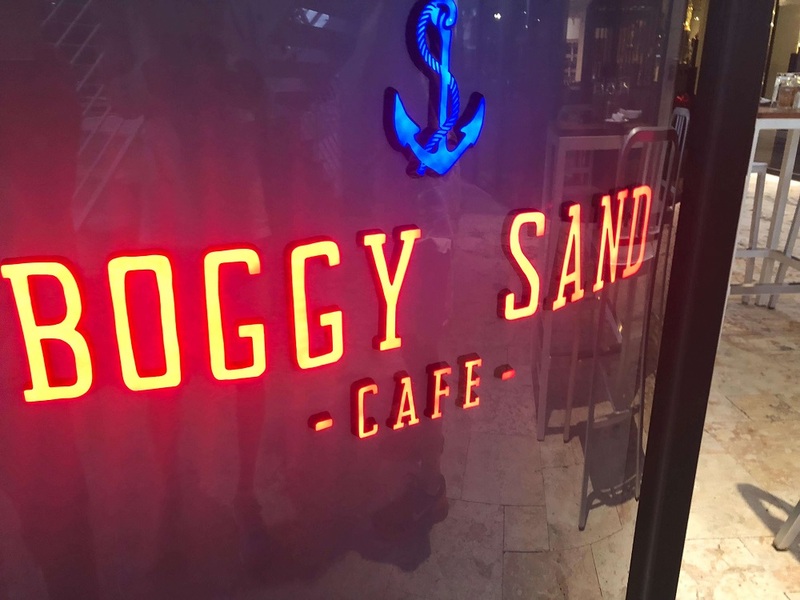 Once my parents got back we visited a bit and then went out to dinner at the Boggy Sand Cafe — the same place we ate on night #1. We joked that our tradition should be to eat there every trip on the first day and the last. I can recommend the Jerk Chicken as a tasty meal. Good food and close to home! We came home after that, packed a bit, and watched a movie before hitting bed. Well, all good things must come to an end and today was that day for our trip. We were up before 8 am and spent the morning eating, visiting, packing, and tidying up a bit. At 12:30 pm (the owner allowed us to have a late check out since no one was coming the next day) a cab arrived and took us to the airport. We all got checked in and sat together, chatting until my parents’ flight left. BTW, the Grand Cayman airport is about the size of our garage. Ok, it’s not that small, but it is tiny. And they have all the planes arriving and leaving at the same time, so the waiting area was PACKED. About 30 minutes after my parents left, we boarded our flight. We got on at 3 pm and by 4:30 pm we were in Miami. Then the “fun” began. 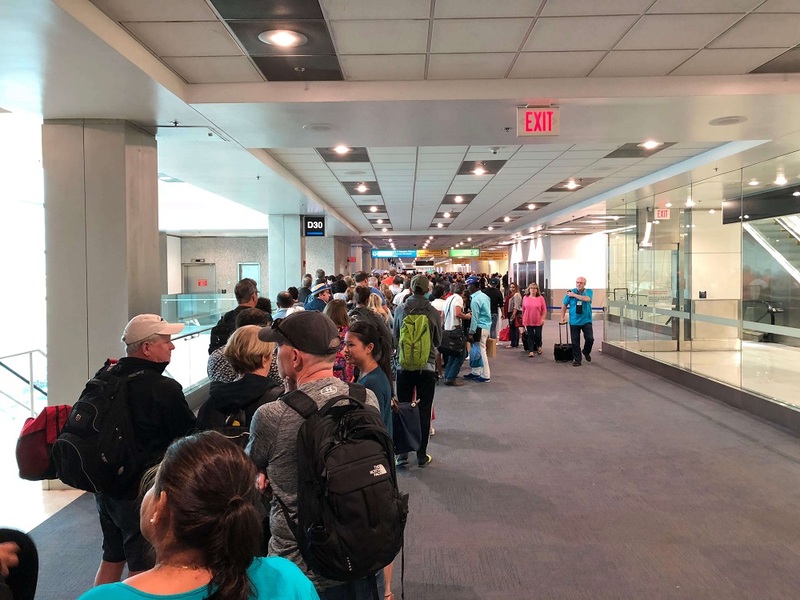 Miami International Airport’s customs process must have been designed by Hannibal Lecter or some other person who wanted to inflict maximum pain. Step one was to stand in the line from hell. The killer line at Miami International Airport customs. Step two was to fill out an electronic pass and get a slip of paper. Thankfully they gave us TSA pre-check slips too. Step three was to stand in the line from hell’s brother. At this point in the experience there were signs asking us not to take photos. I know why — they didn’t want the word to get out how bad it was. 1.5 hours later, we were through customs (BTW, it took my parents 15 minutes in Atlanta). Thankfully we had carry-ons, no checked luggage, and TSA pre-check. Even with that, we got to our gate around 6:30 pm. We grabbed a bite to eat. Grand Cayman food prices made airport food prices look like a steal! We then got on an 8:10 pm flight to Denver. FOUR AND A HALF HOURS LATER (yes, it was brutal) we landed. We called the hotel shuttle and were lucky that when we got to the pick-up area one was already there. But it was pulling out, so I had to chase it down. We got on, went back to the hotel, then drove home. An hour later and after 14 total hours of travel, we were home. By the way, it was good we came home on Tuesday and not the day before. On Monday Denver had freezing rain and then snow that shut down two interstate highways. Then it was sunny on Tuesday and it all melted, so we had no problems. Because this is a personal finance blog and we have to have numbers somewhere, let me share the final expense numbers. We told my parents that their Christmas gift was that we’d pay their $2,000. In addition we picked up a few other expenses for them along the way — like souvenirs, the boat excursion, and the turtle farm. Let’s look at our actual costs a couple ways. Cruising was even 5% more expensive per day if we paid 100% for Grand Cayman but my parents paid part of the cruise. I’m not making a judgment on whether cruising is “better” or not to staying on a single island. I’m not sure if I’ve even decided that 100% in my mind. But we had always wondered how the costs of a cruise compared to an island visit, and now we knew. I thought it would be fun to rate various parts of our trip for would-be Grand Cayman visitors. I’ll use a scale of 1 to 10, with 10 being best. Transportation to the island: Since we live in the western part of the US, the transportation options stink. They are fine on cost, but the trips are looooong. This isn’t the fault of anyone, simply a fact of where we live. That said, the trips are terrible (though they’d be worse for an island farther away) so I’ll give this a 4. Transportation on the island: If you read the entire series, you know how awesome the bus system is. It’s easy, convenient, and affordable. It can be a bit cramped at times, but given all the other plusses it has to offer, I’ll give it an 8. Our condo: I am the type of person who thinks there is always room for improvement, so I hardly ever give out 10’s. However in this case, I’m giving the condo a 10. 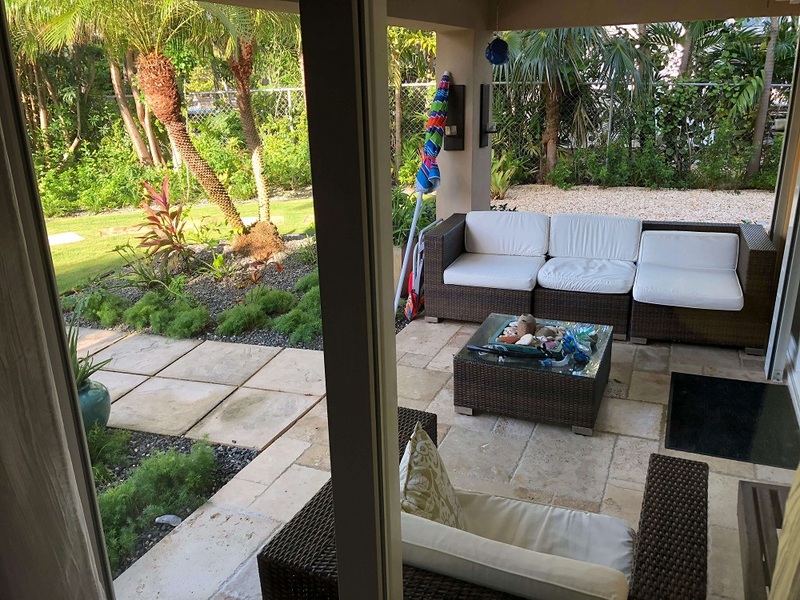 Perfect location, decent price, and very nice inside. And ours was the “best” of the four in our building — bottom floor and away from the street. We would stay there again in a heartbeat. Island food: It’s expensive to eat on Grand Cayman. It was fine for us since we prefer to dine in anyway (it’s quieter at home and the food is more affordable). The food was “ok” but nothing special. And it was really expensive. Did I mention that? So I’m giving it a 5. If you’re traveling somewhere for a fine dining experience, go to France or Italy. Boat excursion: 10. Pure and simple, it was awesome on many fronts. If we go back to Grand Cayman we will be doing this again for sure, maybe multiple times on a single trip. Turtle Farm: I really wanted to like the Turtle Farm, but it was a bit dirty (like the poop-filled water) and really not that entertaining. I’ll be generous and give it a 3. Our beach: I’m going to give it a 9. I can’t recall a better Caribbean beach we’ve been to, but there are a few that are close (in Barbados and Antigua, for instance). Our beach was close, had great snorkeling, was calm enough to paddle board, and was never that busy. I’m going to say it was the best beach on Grand Cayman. As I was telling my wife about this series, I commented how many days we “simply” went to our beach to snorkel and paddle board. She reminded me that 1) that’s what we often did when we cruised and 2) those excursions would cost us $50 to $90 per person to do. 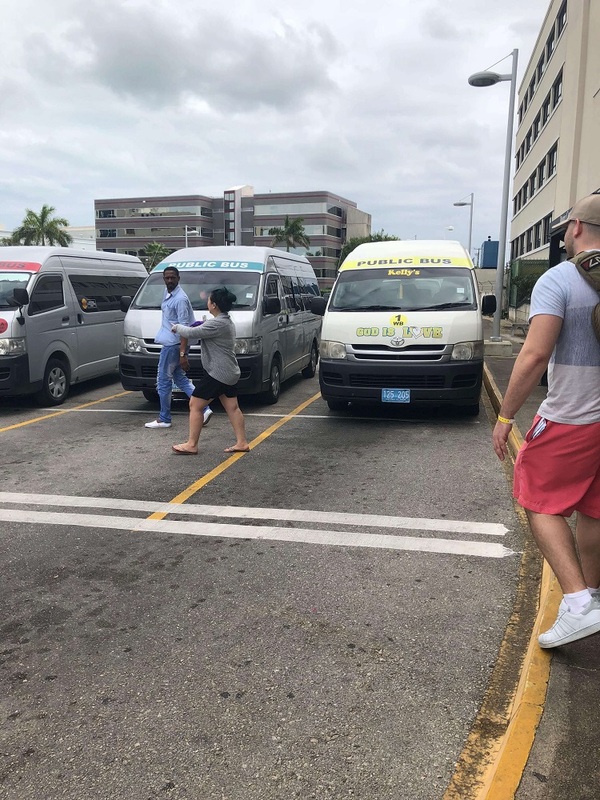 So by staying where we did, we were able to take multiple excursions (in effect) for very little cost compared to cruising. Other stuff to do: While we only went out a few times (why did we need to since the beach was so nice? ), if you wanted to do something different and exciting every day, you certainly could. Like every other island in the Caribbean, there are a host of water activities that could keep you busy for a few weeks. 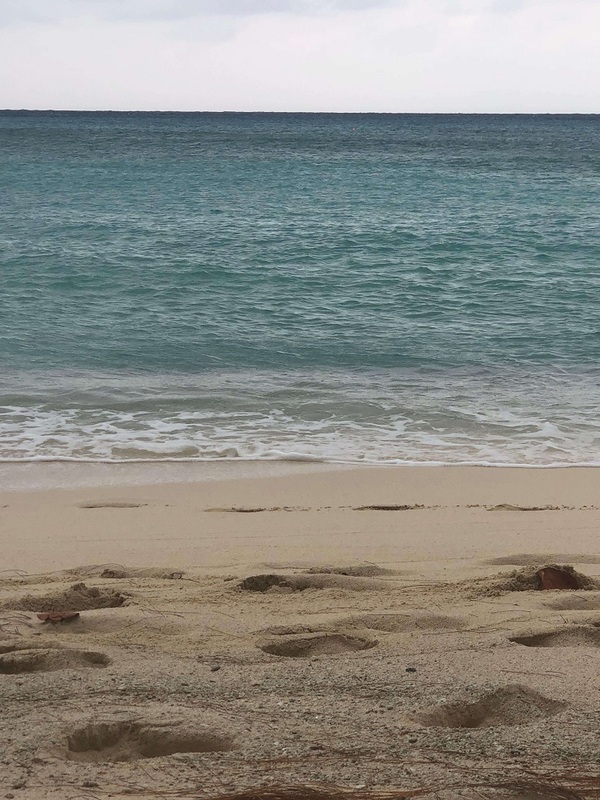 In addition, the snorkeling is among the best in the Caribbean and there are multiple places to go. I’ll give it a 7, though if I tried a few more things I might rate it a notch higher or lower (depending on the experiences). Overall: Looking at the trip as a complete package, I’ll give it a 9. The only trip that was even comparable to it was our 12-day cruise from NYC to the Caribbean and back several years ago. Each of these trips had some great and unique things about them, but both would be hard to improve upon. Perhaps the food could be cheaper or the weather a bit better (we did have overcast days some days), but there wasn’t much we’d change for people like us who simply wanted to do a few things and relax with family the rest of the time. Well, that’s a wrap! It’s probably more than you wanted to know about our trip. In parting I’ll leave you with a few fun pictures that didn’t make it anywhere else in the series. The patio view from our bedroom. We spent many a fun day and night sitting here, chatting, and relaxing. Our pool, taken from the other side facing the condo. Our patio is in the far left of the photo. The short walk from our alley to the beach. Looks like you guys had a great time! It is so important to get away sometimes. My wife and I are leaving for a short weekend getaway today, in fact. Grandparents are coming up to watch the kids, too! So, first trip kid free in probably six months. Really looking forward to it. All in all, seems like you guys really did do your research and had a great family time! Thanks for taking us on your journey. Really enjoyed keeping up with it. 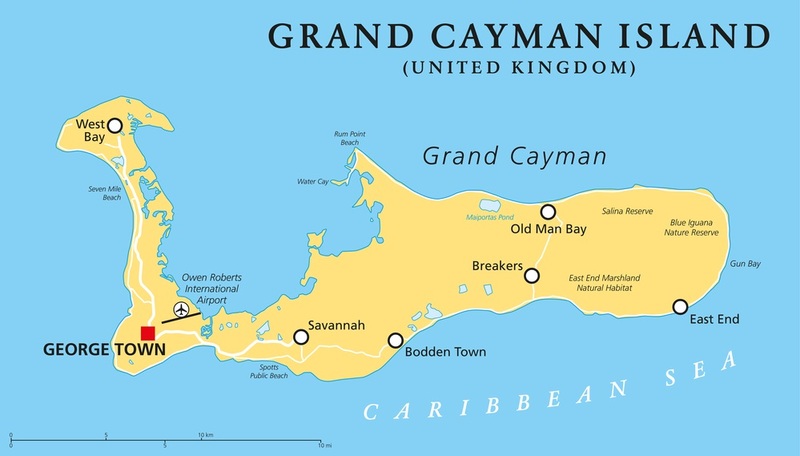 The Grand Cayman’s sound fun to visit. May have to give them a shot when we take our 10 year anniversary Carribean trip in 18 months. Thanks for all the travel details! I’ve always been frustrated when cruising that it’s so expensive to just do something like go to the beach, so I’m much more of a fan of hanging out in one place and doing things on my own. 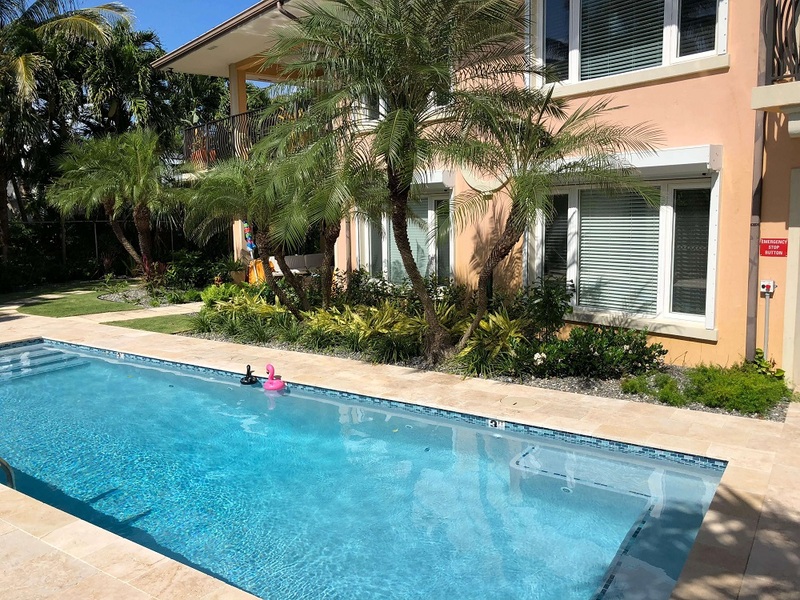 That condo does look amazing, and so does the pool! Was it hard to go back to Denver and the cold after being in the warmth? I know that for us, leaving the long warm days of Santiago in January for the short, freezing days in New Hampshire required an adjustment period of about a week and a half. So true! I’ve taken some trips to FLA from the cold during the winter – feels even colder when you get back lol! Yes, hard to go back. I love just taking trips down the beach as well, typically when I do this these days a podcast will be playing. If you go when the sun is setting or rising, so so peaceful and helps you remember just how wonderful we have it! Thanks for the trip details. I’ve never considered an island trip like this before. You have provided great information. The only island I’ve been to, is Sanibel, which we took for our 20th anniversary, family trip. It was a nice week and would enjoy returning. Thanks for sharing all of your experiences from this trip! It looks like your family had a great time down there. I have been to the Bahamas, Dominican Republic, Jamaica, and will be going to Mexico in July. 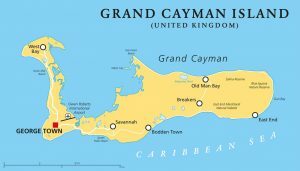 I will have to add Grand Cayman to our future list! Glad you enjoyed it! We didn’t know about the shopping cart “rule” you shared on a previous post. I was shaking my head at the inconsiderate people leaving shopping carts by the road! I was also glad to learn about your positive experiences with the buses. We have always rented a car, but will probably try the buses in the future. If you go back, I recommend a visit to the Botanic Park. It is small, but has some beautiful trees and flowers. The Color Garden is the best. It costs $25 U.S. for two. I’m curious where you were able to walk on the beach for a couple of hours. 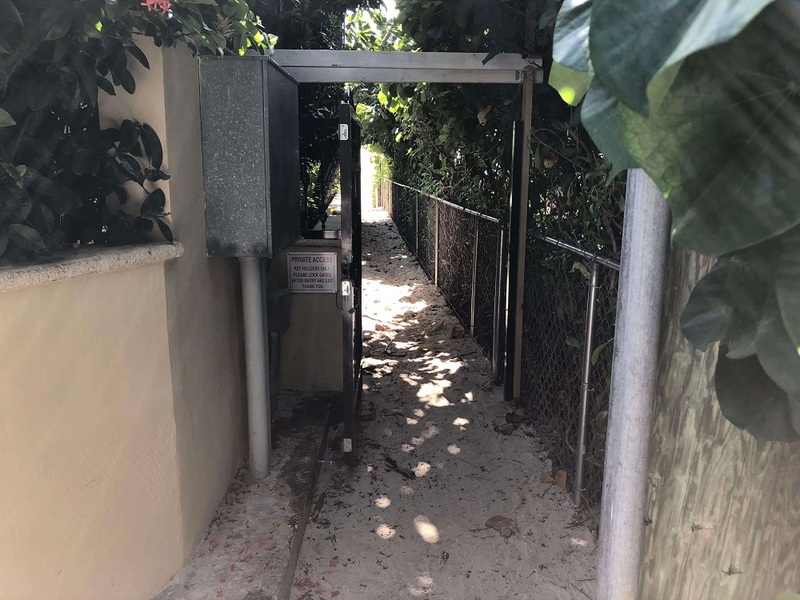 Was it the beach by your condo? We walked down that beach and didn’t get very far before we ran out of beach and had to walk on the slippery rocks in the water to get to the next beach. We will certainly check that out! 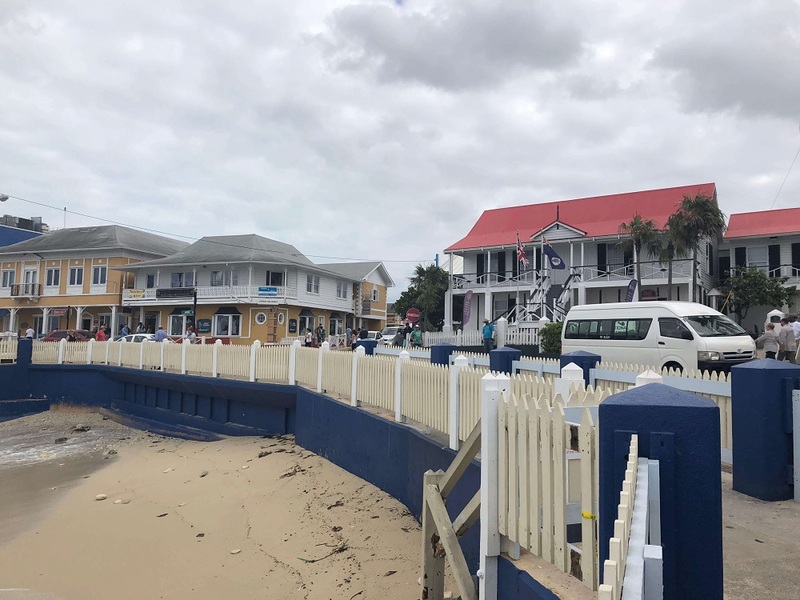 We started at the beach by our condo and walked south, toward the heart of Seven Mile Beach. We took our time, stopped here and there, etc. An hour down and an hour back. If you walked north, you ran into rocks, just as you said. Miami International customs and immigration are always a zoo, at least in my experience. If you do a return trip you might check and see if you could go through Dallas or Houston instead. Again, just based on my particular travel history, I seem to have less of a “zoo” experience at these two and seem to get through much quicker. I agree. Next time we’ll try to fly back through Dallas (which is how we went there). What a great vacation ! love all the details of the story so much i can almost feel the warm sun on my back. A couple of points I see here. 1. Your FIRE and still take some very good and not necessarily cheap vacations. A lot of early retirees write on how cheaply they live. You are doing FIRE the way you want to. I don’t want to retire and just exist. I want to do some nice things and one thing is travel. 2. Cruises are popular because people don’t want to plan. They just want to show up and have fun and it will cost you big time. Same can be said about Disney. You did some research and planned a beautiful vacation that was 100% unique. Something I did for our 25th wedding anniversary. 3. You took a chance and it worked well.Most people don’t want to take a chance or to even plan there lunch for tomorrow. For me personally there are many places in the USA I want to see that can be just as exotic and fun. I cant believe you went to the Cayman Islands and ate frozen pizza. We had some of the best inexpensive BBQ there. Likewise great BBQ shacks on St. Martin. Eating at tiny local spots is one of our favorite things to do while traveling and it really allows you to appreciate the local culture. Give it a try sometime! I am TOTALLY not someone who has to eat out to enjoy the local cuisine. I prefer to eat at home actually. And since our “home” was basically on the beach, why not? We did eat out a few times (if you read the entire series) and it was “ok” each time. To be honest, the frozen pizza was just as good or better — and a fraction of the cost. Out of curiosity, where did you eat in Grand Cayman (location and name of place)? It’s likely we’ll head back there next year.